Once this feature is enabled, patient's who are enrolled in the designated subscription level will have the ability to submit a medical question to the clinic through a secure conversation. Click on the New Conversations button. Select Ask a Medical Question. Using the drop down menu, the patient will select the clinic that they wish to submit a medical question to. Enter the Topic and Question. The patient will also have the ability to attach a file to send to the clinic. 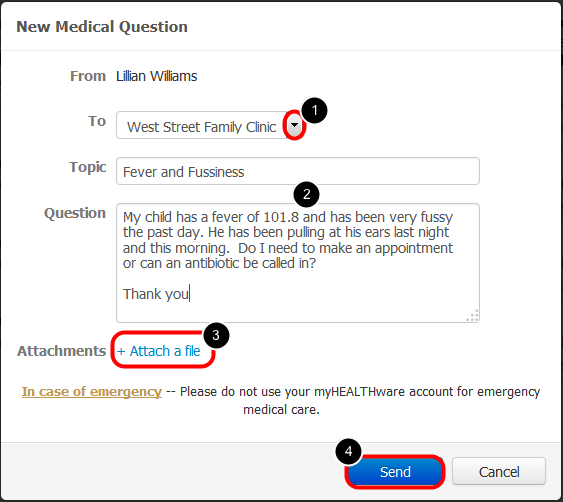 Clicking the Send button will send the message to the clinic and will log the new conversation in the patient's Conversations inbox. Once the patient has submitted a medical question, the message will be placed into each clinic staff member's Conversations inbox that has permission to Manage Conversations for the clinic. The message from the patient will be labeled "Medical:" and include the Topic and Question, as well as any attachments that the patient submitted. To view the message, the clinic staff member can simply click on the message. 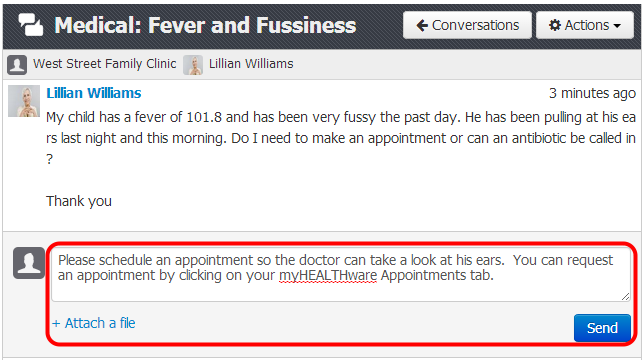 In the Reply box, simply type in the response to the patient, then click Send. 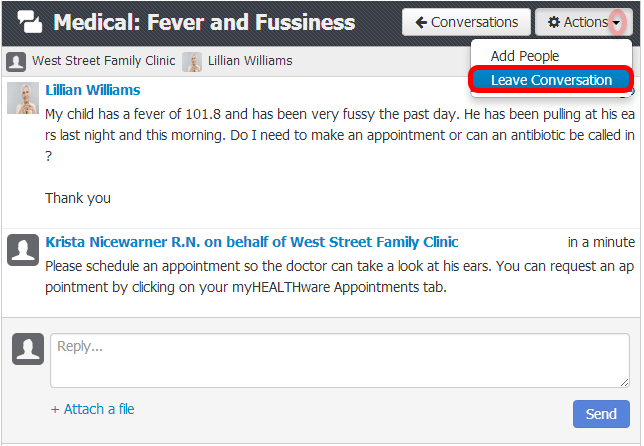 The clinic can attach a file to the conversation by clicking on +Attach a file. Once the response has been submitted to the patient, the clinic can leave the conversation open or they can choose to archive the conversation. To archive the conversation, click the Actions drop down button, then select Leave Conversation. This will notify the patient in the message that the clinic has "left the coversation," and will not receive additional comments or responses within this conversation.